When selecting a head, one wants to pair the legs with a head that will not compromise the stiffness of the system as a whole. On the other hand, a head that is too big adds diminishing performance increases and just adds weight. The GIT304 is not super light, so it is generally worthwhile to err on the side of getting a larger head that will both be stiffer and have better ergonomics. 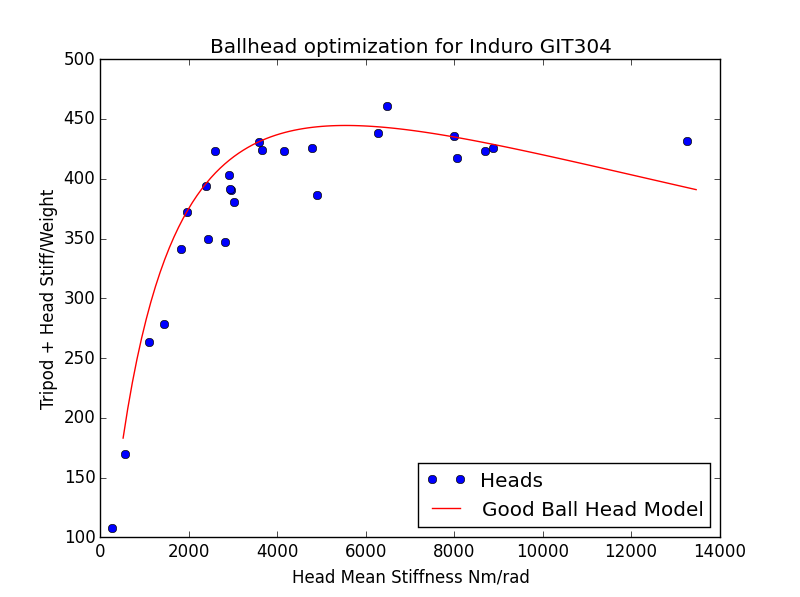 Below is the optimization result for selecting a ball head. This chart plots the stiffness to weight ratio for this tripod and each ball head that I have tested in blue dots versus the stiffness of those heads. The red line is a generalized model for a strong performing ball head. The higher up on the this graph the higher stiffness/weight performance of the system. More information on this analysis can be found in the ball head choice optimization page. This chart is telling us that we want a ball head with stiffness of at least 4000 Nm/rad. This puts quality mid size heads and all full size heads in the proper range. Given the size of the legs, I would err on the side of getting a full size head. The GIT304 is a great tripod on which to use a pan tilt or geared head as well. Such heads tend to be much less stiff for their weight than ball heads. So, if you do want to go down this route, it is worth picking a good as to not compromise the stiffness of the combined legs + head system. Note that these recommendations are limited to the tripod heads I have tested. The more general discussion above should provide adequate guidance if your head of choice is not listed. Sirui K-40X The price to performance of the Sirui K-series heads is unmatched, and should thus pair well from a stiffness and value perspective. If you are looking at buying this tripod, I am assuming that you are a cost conscious buyer, and so aren’t looking for a head that costs just as much as the legs. Sirui K-30X The K-30X is just a smaller version of the K-40X. Purely from a performance perspective, this is the best head for the GIT304. It is plenty stiff and is significantly lighter than the K-40X.